Warzone Control is a new mechanic introduced into Faction War that quantifies how well a particular Faction is doing. It uses a basic point system, with each system having the potential to contribute up to 6 points toward control. With 70 systems, the Amarr/Minmatar warzone has a total point value of 420. Initial capture of a system gives 1 point toward the victorious Faction. A faction then can upgrade each owned system up to five levels by inserting LP contributions in the system's I-HUB. Each level contributes an additional point to the Faction's total Warzone Control. In the Minmatar/Amarr warzone, it takes exactly 84 points to advance a Control level, no matter what level you are advancing to. Because of this, there is a minimum numbers of systems that must be owned in order to reach each level of control. 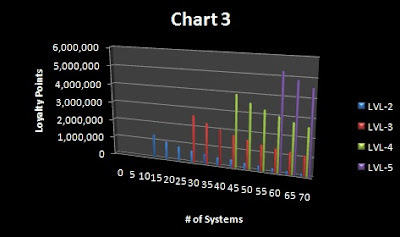 The following chart (Chart 1) shows the Warzone Control level, the point range that is associated with that level, as well as the minimum number of systems needed in order to acquire that level. For example, in order to get to Warzone Control 2, a Faction in the Amarr or Minmatar militia must have at least 14 controlled systems. Also, because of this system, a Faction can not advance through Warzone Control tiers without also upgrading their systems. Even if a Faction were to take control of all 70 systems, the Faction's base point value would fall short of reaching the second tier, which is when bonuses begin to kick in. It takes a moderate amount of LP to upgrade one system. (Upgrades within a system should not be confused with Warzone Control LVLs. System Upgrade levels only reflect upgrades within a singular system, whereas Warzone Control LVLs display a Faction's overall control in the entire warzone.) 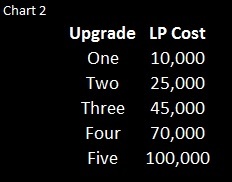 The following chart (Chart 2) shows the amount of LP required to upgrade one system through five levels. Because it is cheaper in LP to advance a system through lower level Upgrades, but point values are the same for each upgrade, it is cheaper to maintain Warzone Control levels the more systems you own. Is it worth it to upgrade a system? Not only do upgrading systems contribute to Warzone Control, upgrades also give in-system bonuses, including additional industrial slots and clone discounts. Approximately 8 clones for 85-90mil sp characters would have to be sold to make the upgrade within one system worth it based on clone discounts alone. Convenience of industrial slots is impossible to quanitify, however if a corporation does a lot of building and research, they may find the slots useful. Also, it is important to note that the number of LP a Faction will gain from plexing a system from start to finish (taking sovereignty) is upwards of 3+ million LP. The 100,000 LP required to upgrade a system is relatively a small amount of LP in comparison to how much LP was gained in taking the system in the first place. Is it worth it to get a higher Warzone Control level? To determine the benefits of upgrading a Faction's territory as a whole, we must look at LP store discounts, and compare these discounts with the amount of LP it takes to reach that level. For example, a general Faction Battleship goes for a base price of 1,000,000 LP in the store. At level 2, this is cut in half, and then again at level 3 and level 4. Based on the maximum number of LP that would be required to initially reach each Warzone Control level (based off of a Faction having the minimum number of systems needed to obtain that control) and the dsicount rate for each level, a militia would only have to purchase 3 of these Faction Battleships before the initial LP spent to tier up the entire warzone would pay for itself. For level 5 Warzone Control, the LP spent initially would be worth it after 6 battleships were purchased at 1/16 of the base price. However, it is important to keep in mind that once a system has been upgraded, hostiles plexing in that system could reduce levels and force furth LP to be required. Even so, moderate usage of a militia's store will more than pay for LP used in upgrading systems. There are a lot of things to consider when taking and strategizing about sovereignty. Not only are systems currently harder to take, the system upgrades required to maintain Warzone Control levels need maintaining. In this way, Factions will need to think not just about initial take overs, but strategize the best way to maintain the space that they have. Acquiring Warzone Control in Faction War is a very lucrative undertaking, but also a very risky one. very interesting. Sounds like FW gets the activity based sov holding that 0.0 could need. Patrolling space and keeping the enemy out of plexing down your control sounds good to me. Aren't the LPs in the I-Hub a further defense against system takeover? As far as i have understood it can only flip once all LPs are drained from the hub. In that case investment into that upgrade is also buying you time to get rid of your enemies. Nope, the system flip mechanism relies on victory points, not loyalty points. You can continually pump LP into upgrading a system right up until the point they take it from you if you don't spend the time to defensively plex and reduce the contested percentage of the system. Many have said "theres no reason to defensively plex, wheres my LP?" But this is why pilot should defensively plex. To save their space. Otherwise, no matter how much you pour into the Ihub, if youre not out fighting off the enemy you will lose sovereignty completely. Hans has the gist of it. Perhaps what is confusing the issue is that earning LPs via plexing inside a hostile system does remove LPs from the I-hub at a 1:2 rate. So if yo close a small plex for 10k LPs in a hostile system, the I-hub loses 5k LPs. In this way, offensive plexers can downgrade the system levels and defenders will need to keep putting LPs into the I-hub to maintain the bonuses involved. But, as Hans says, putting LPs into the I-hub does not change the fact that the system is being contested as shown by the % contested stat. So defenders could keep pouring LPs into a hub to keep it at level 5 everyday, but as the attacks ran more plexes, removing LP they are also increasing the % contested. The only way to reduce the % contested of a system is to close the plexes that spawn there defensively. For this the defender gets no LP, but he saves the LP in the I-hub (since enemies closing the plex would remove LP from the I-hub) AND reduces the % contested in the system. Trust is a big factor in FW and trying to earn it is very difficult because of everyone's paranoia about spys. Perhaps the general miltia can be used to help hold and maintain the space that the major corps have taken. Thus helping to earn trust. Trust is easily earned by going out to kill people and being active. Staying docked in station waiting for a fleet will not get you anywhere in FW...or any part of space for that matter. You only need to get people willing to put out about 5 million lp at once. So you get about 30 people who can contribute 200k each (about 6 level 4 missions worth of lp) together at the same time. Dump it and cash out. Just get all the stuff you need ready and buy a bunch of stuff.